In the production processes of various pharmaceuticals, bulk drugs, agrochemicals, pesticides, dyes, dyes intermediates, textile, power, water treatment, galvanizing and various other chemical industries; waste waters produce essentially consist of several organic components, salts and water. Treating these waste waters is very difficult as they are toxic and cannot be treated in a bio-reactor due to high salt contents and hence also hinder dumping. The only method of disposal is to remove all the water, solvents and produce solids for reuse/disposal. In case of high COD contents having high boilers, the only option of disposal is by incineration. In such cases too, concentration prior to incineration is recommended. Both these tasks of concentration and separation can be optimally achieved with thermal treatments, technologies consisting of evaporation and crystallization. The water portion is concentrated in the evaporation plant. 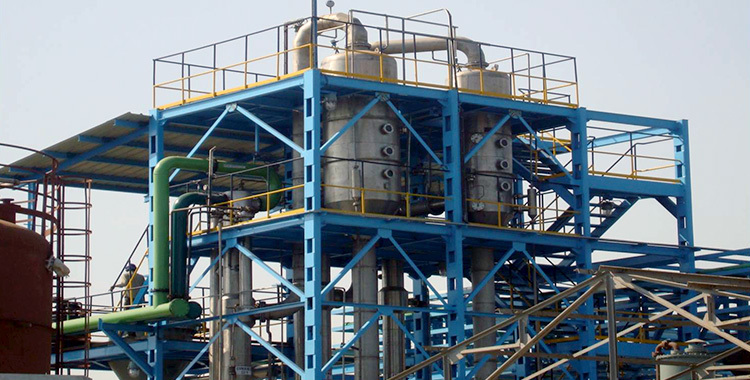 The salt is separated by crystallization which may be by way of evaporative crystallization or a separate crystallizer arranged downstream of the evaporation plant. Then if required the volatiles are removed from the vapor condensate in a rectification column/stripping. Thus only the concentrated organic matter which is very small in quantity has to be incinerated. In biotechnological production/processes, a biological treatment is not efficient, or is too complex because the continuation levels of organic substances and salts are very high. However these contents may be suitable for the production of fertilizers and animal feeds/fodder. Hence the best treatment solution for these waste waters is to first concentrate them in an evaporation plant and then dry the residual matters for further use in the production of fertilizers/animal feeds/fodder. Here usually the evaporation plant is of multiple effect and the configuration consists of a combination of falling film followed by forced circulation effects for concentration of the waste waters. Heating mediums and plant layouts are on the chemico-physical properties of the waste water and the available utilities. 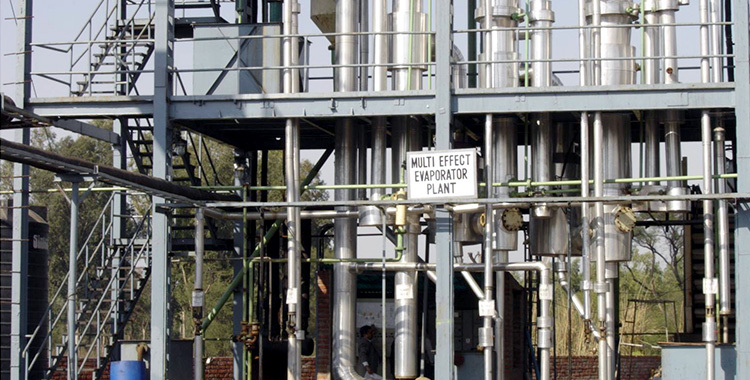 Waste energy from available sources and evaporator vapors can be utilized to optimally heat the evaporator. 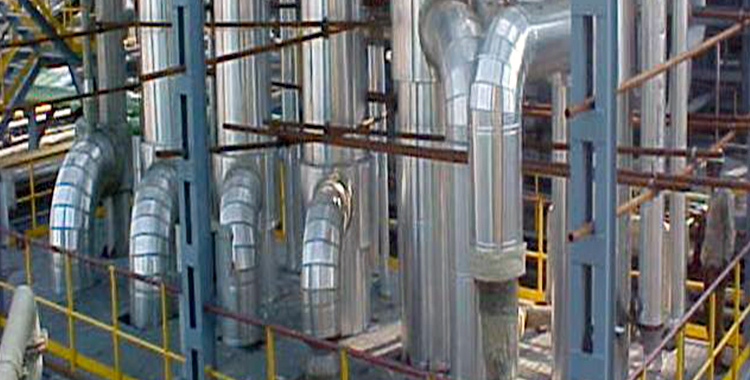 The condensate can most of the times be reused in the production process. 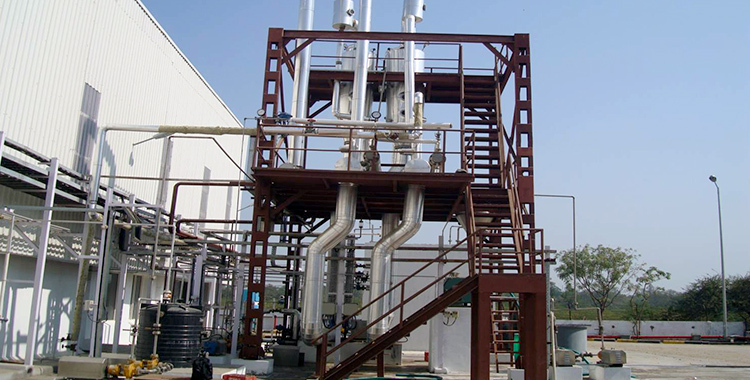 Raw materials for bio-gas production are so-called fermentation substrates, such as corn, grain and grass, stillage from distilleries, manure, biological waste, remains of food and other fermenting residuals. After the anaerobic fermentation there are fermentation residuals, a mixture of persistent organic substances. The disposal of these fermentation residuals is decisive for the costefficiency of a bio-gas plant. Its storage and transport to agricultural areas is cost-intensive since the produced fermentation residuals are large (water contents 90 – 95 %). Evaporation strongly reduces the quantity of fermentation residuals and therefore contributes to a solution of these problems to a large extent. The efficiency of evaporation will be particularly high if waste energy sources, such as vapor from a drying process or hot water from gas motor cooling can be used as heating medium. The fermentation residuals are de-watered in decanter centrifuges. The phase with high portion of solid matters is supplied to the dryer. After acidification and de-gassing, the liquid phase is evaporated. The concentrate of the evaporation plant is dried together with the solid matters from the decanter. The vapor condensate is further cleaned in a membrane filtration plant or in an alkaline water scrubber, and can then be used as process water. The energy for the plant operation comes from small de-centralized block heating power stations. Large quantities of industrial waste waters/effluents with strong contaminations of different compositions are generated in the production and processes of almost all industrial sectors. These waste waters have to be treated before they can be discharged into the specified permissible system. Hence an efficient and environmentally friendly waste water treatment is required. Chem Process partners with you to provide the best solutions for treatment of industrial waste waters. 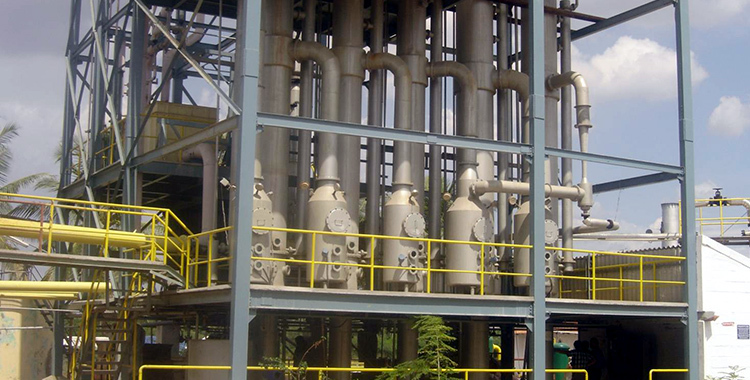 As one of the leading designers and manufacturers of thermal and mechanical process equipment with core competence in evaporation, crystallization, vacuum and heat transfer, Chem Process offers custom made plants with additional upstream or downstream process steps. Suitable combinations of processes in our plants achieve optimum results for the recovery of water and valuable products. 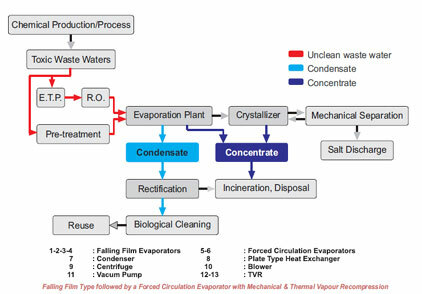 If the characteristics of the waste waters cannot be clearly defined and if its constituents, dry matter contents, pH or particle size change frequently, and if they have to be concentrated substantially, then thermal separation is the best solution. 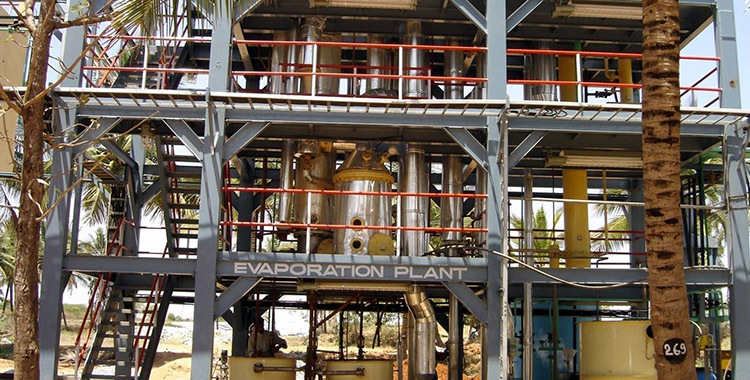 During the design of evaporation plants, numerous factors have to be taken into consideration viz. waste water specific product values, power and utility costs and site condition. The type of construction and arrangement, other process engineering and operational data are based on these parameters. Energy consumption determines the operating costs of evaporation plants. 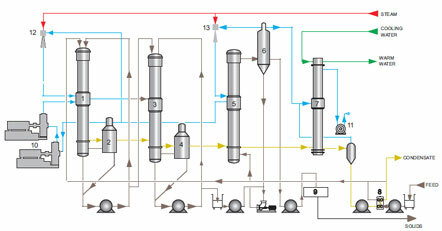 With our ingenious thermo-technical combinations, the plant energy requirement is minimal. 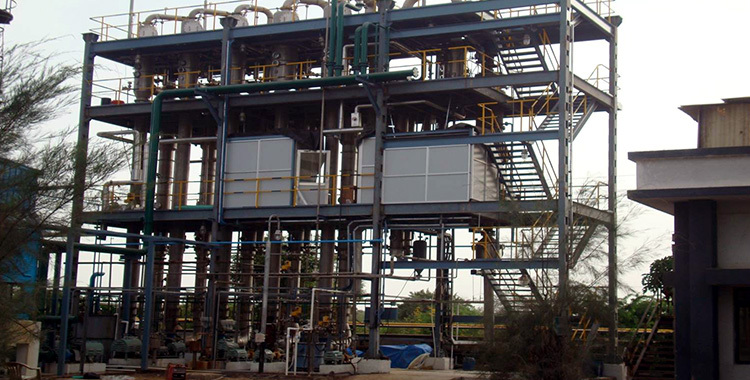 Chem Process actively takes into consideration the customer’s energy situation while designing a plant so that it offers the best possible economical solution. 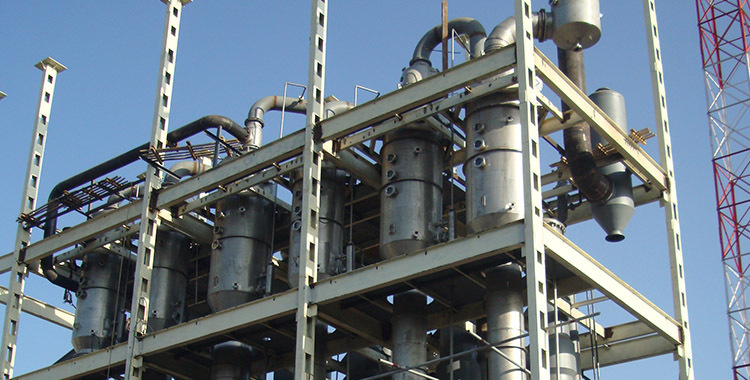 If specific particle sizes and products have to be removed, membrane filtration plants are combined with evaporation plants either for selective separation of the impurities, or as an initial effect to recover specific valuable matter, or to pre-concentrate before feeding to the evaporation plant, or to treat vapor condensate coming from a thermal treatment. Chem Process has an in-house research and development centre with the required laboratory equipment, where waste waters are tested and treated for their behavior and based on the results, appropriate plant components, pre and after treatment are selected and designed. Mobile pilot plants are also available, which if required are sent to our customer’s location for carrying out tests. 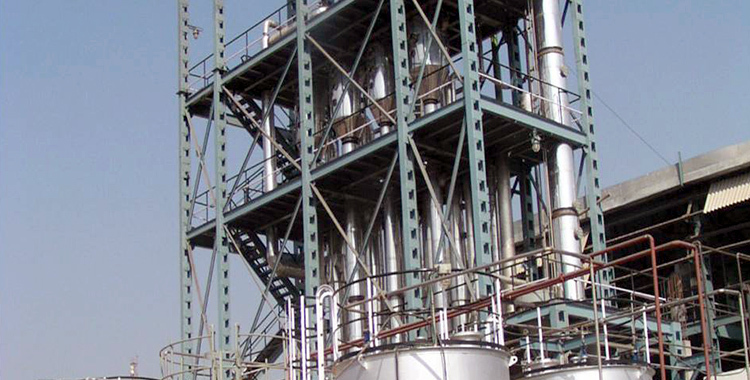 Plants designed and engineered by Chem Process are recognized for their high quality, efficient performance and economic operation. 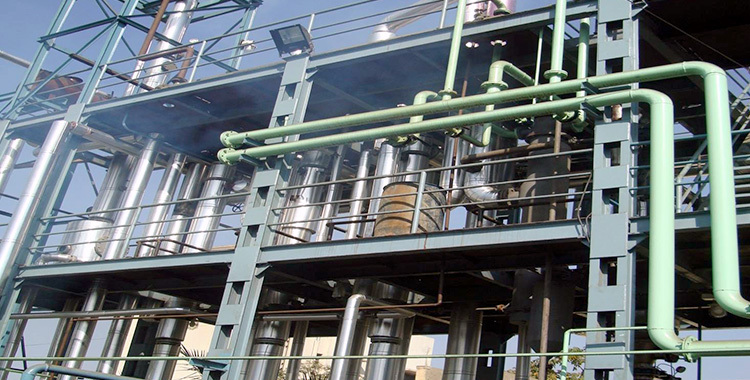 All process and functional requirements are taken into consideration and hence operations of a Chem Process designed plant are reliable and operator friendly.